Last month, the Sinclair ZX Spectrum computer turned 25. The Guardian had a special tribute to this classic little home computer that "made a generation of younger people - and some of their parents - computer literate, and for a while instilled a genuine affection between man and machine". The BBC also has an excellent article here. I managed to get my hands on a Speccy somewhere in January 1985, when my dad bought one for the family. This was the 48K Spectrum+, released in October 1984. The Spectrum+ introduced no changes to the basic Spectrum hardware but provided a "professional keyboard" replacing its much talked about yet violently disliked dead-flesh-feel rubber keys. In India, a company called Decibel marketed this under the name 'dB Spectrum+', and become reasonably popular in the sub-continent during the 1986-1989 period. Some of us, like me, had the original, smuggled into the country guised as a sleek typewriter. But you needn't explicitly declare to customs control that it was a typewriter. In those days, the customs officials at Indian airports would let you off on grounds of insanity if you tried to convince them that you had a computer tucked away in your hand baggage. Having said that, letting them make their own conclusions was always safer. It's somewhat sad that it all came to an end, and reluctantly, I had to switch my allegiance to an IBM compatible Personal Computer. But for me, being reminded about the Speccy, is always like getting drenched in a shower of nostalgia. After endless hours on games such as Manic Miner, Skool Daze, Daley Thompson's Decathlon, Jet Set Willy, Chuckie Egg and a host of others, I eventually tried my hand at learning BASIC. From then on there was no looking back, and I found myself hooked on to Z80 (that's the Zilog CPU that the Spectrum uses) assembly language programming. Right about that time, I recall having independently come up with a 12-point list of medical excuses that I could use for missing school! It may be hard to believe for today's Intel Core Duo users, that the Speccy actually loaded its software from cassette tapes, and anyone who owned a Speccy together with a double-cassette recorder was almost always a prolific pirate! You could actually fit in a huge compilation of games and other software on a C90 tape, and loading a 40 Kilobyte game took a staggering 5 minutes during which you had to sit in front of your TV and watch colourful lights dancing to the rhythm of the bytes. One thing that the ZX Spectrum taught me, and something that I've advised a lot of my friends and acquaintances over the years, is that its not always necessary to ensure that you have the fastest and the latest computing system. What matters is what meets your requirements, and in the end, any computer is only as good as its user. During the time that I owned my Speccy, I'm glad that I was able to keep pushing its limits, thanks to the help of numerous books and magazines that it had spawned. Whether it was coercing pixels on the screen where you couldn't, or connecting and controlling home-brewed hardware that you really shouldn't. The enthusiasm and energy that this machine generated really does live on till this day. It taught countless individuals across the world that you needn't accept given limitations, and a little can go a long long way. I'm getting all misty eyed now. Ah yes - I remember the grey dead-flesh keyboard, where each key seemed to have 6 different functions. They don't make them like they used to - fortunately! Another speccy user here. 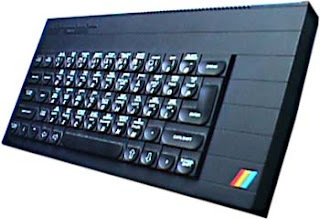 I'm trying to update the wikipedia entry for the ZX Spectrum clones with some more info: https://en.wikipedia.org/wiki/List_of_ZX_Spectrum_clones. Unfortunately, I can find little to no information on the db Spectrum+ that was manufactured by decibells India. I was wondering if you remember the price point of the system and which stores officially distributed software for it (ComputerPoint was one) in India? OOC, is your speccy still working?